Kyrie Irving got season-high 47 points to go with six assists which is his best scoring output in Celtics uniform! Kyrie started off hot, scoring 18 points in the first 12 minutes of action and stayed that way throughout the whole game. He also got 8 of 14 team points in the overtime as Boston made another successful comeback from 13 points behind. Jaylen Brown added 22 points and nine rebounds which means Celtics starting backcourt combined for 69 points on the night! Jayson Tatum chipped in with 15 points as he was just one rebound away from another double-double, showing some great rebouding down the stretch. Marcus Smart finished the night with 12 points, eight assists and two steals and once again was plus-15 in the game, despite poor shooting night (just 2-for-11 from downtown). 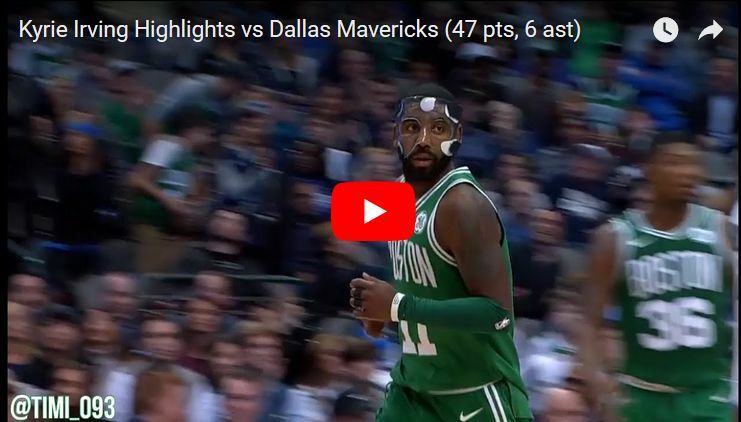 And last but not least, Celtics defense is still the major key for winning games as Mavs needed five additional minutes in overtime to crack 100 points.